Life without a backband. Jitsu 5-2 diet update! A drysuit is held as the pinnacle of a kayakers kit list. 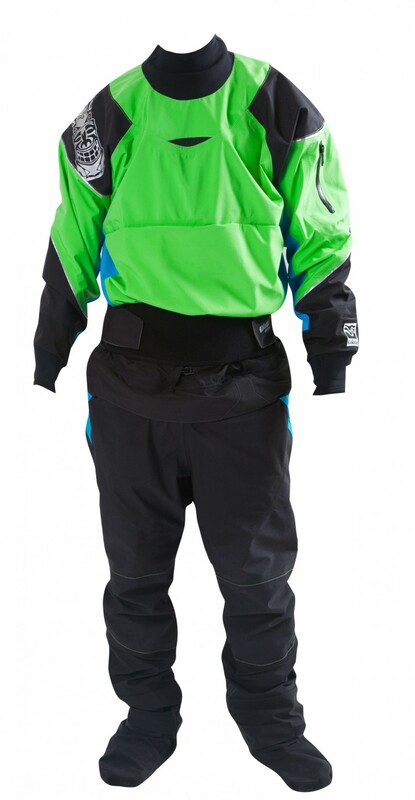 Owning a drysuit can inspire confidence due to the way the wearer can wear all sorts of warm layers, including socks, as well as not having the hassle of having to get completely undressed to get changed at the take out. Often in pouring rain or cold. A good drysuit therefore is a really nice bit of kit to own. In the last couple of years or so I have stopped wearing my current drysuit, a Typhoon Multisport 3, so much, and have instead opted more for dry trousers and a cag. My reasons are that unless it is very cold I prefer the less restricted feel of movement that a cag offers. Drysuits are often made of heavy material and feel quite bulky, so sometimes I am prepared to lose a bit of comfort in terms of perhaps being a bit wetter in favour of having less restricted feel of movement. 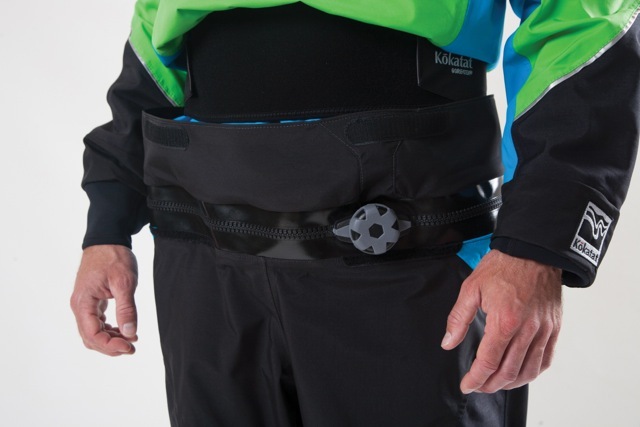 Recently I had heard that Kokatat were going to start making a drysuit that connected at the waist. This promised to have two big advantages over traditional designs. The first is that the top half can be used as a normal dry cag in the spring/summer months. The second is that as a full drysuit there is none of the restriction of movement that is brought about by a shoulder or front zip. It also prevents the “Flash Gordon” costume look that is brought about on one of the shoulders from the traditional front zip designs, so it looks a lot cleaner. When Canoe and Kayak Store offered me a chance to try out the new Idol suit I jumped at the chance. First of all I have to confess that I am not a big fan of Kokatat colour combinations. The Idol suit comes in a bright green/bright blue and grey combo, which is not a palette I would ordinarily go for. That said plenty of people who saw me wearing the suit commented that they liked the colour scheme. My girlfriend also has her eye on it because it matches the colours of her Jackson Karma perfectly! The Goretex material that is used for most of the suit is lightweight and flexible. Harder wearing Cordura is used in selected high wear places such as the shoulders, wrists, knees, feet, and seat. Overall the design is fairly simple, with neoprene cones used to protect the latex seals at the wrists, as well as on the neck. This makes sense, and I prefer this simplicity to adjustable necks and wrist over protectors. The design is completed with the addition of a small pocket on the left arm, a central drainage outlet to drain water that gets into the neoprene outer neck cone, and velcro tabs to seal the tunnel against the spray deck. When worn as a separate dry cag, the zip at the bottom of the spray tunnel is protected by folding a flap over and sealing it with velcro. This will help prevent the zip becoming damaged when the top is being used without the trousers. The waist zip seal on the Kokatat Idol drysuit. Putting on the Idol drysuit requires a bit of a knack at first. But do not be put off by this as you will soon get the hang of it and be able to zip and unzip the suit with speed. There is no convenience zip because the separates come away so easily although I have to confess that I am not so sure how easily the zip can be connected again while wearing a spray deck. Once the zip is done up, a task that does not require the help of others, another bonus, it is sealed with a screw on tab. At first this looks like it might get in the way and push against the body as it is quite bulky. However I can say without question that I did not notice it at any point while I was using the suit. Once the suit was on the lightness and flexibility of the material became all the more apparent. I have not worn a drysuit that was as comfortable as this one. I have not tried Kokatat gear before, although I have been told by regular users that this is a trait of their dry cags and drysuits in general. Quite simply I did not know that I was wearing it. This is in part due to the cut, but also due to the lightness of the material. It would be reasonable to ask how robust the material is as a result of this, but Kokatat drysuits are well proven to last and their warranty and repairs service is unparalleled. So I would not have thought that the longevity of the material is in question. At approaching £1000 this is not an inexpensive investment. However if the suit lasts a good 20 years or so, as many Kokatat suits have been known to, that’s around £50 per year. Even £100 per year for half that lifetime would appear to be worth it. I do have one caveat, though. And that is the wear and tear on the dry cag upper compared to the trousers should it be used all year round. Although given the construction of the suit it should not be difficult to be able to purchase the top separately as a replacement. When the Kokatat Idol drysuit is released in January it will usher in a new way of thinking about drysuit design. Along with Typhoons new hinge design we will hopefully see more drysuits on the market with a similar freedom of movement and lighter weight. With its ease of movement, light weight, and useful design, I would certainly give serious consideration to the Idol when it is released. If only it came in colours that I liked! Edit: I have been informed that the Idol is also available in yellow or dark blue top, with dark (grey or black) trousers, too. This entry was posted in Gear, Reviews. Tagged dry cag, Idol drysuit, Kokatat, review. I bitterly regret buying the Kokatat Idol. The zipper is a nightmare and is so hard to fully zip that it eliminates any convenience of the 2-piece design. In fact, even when I think it’s fully zipped, it’s not and if I take a swim I end up with several quarts of water in my suit. DO NOT BUY THE IDOL! I’d return mine if I could, but I thought in time I’d get used to the zipper. This is NOT going to happen and I don’t know what I’m going to use this upcoming winter for cold-water kayaking in the cold.